Tuindeco are based in Holland and have distributors across Europe. Tuin is the sole UK importer and distributor of the entire product range and we sell direct to the consumer as well as offering trade accounts for established businesses with show sites. We are a very strongly customer focused business and we try to make dealing with us easy. We love our products and all of the staff have considerable experience, we can offer advice and expertise across numerous areas. We offer a personal service and an out of hours support network via email. 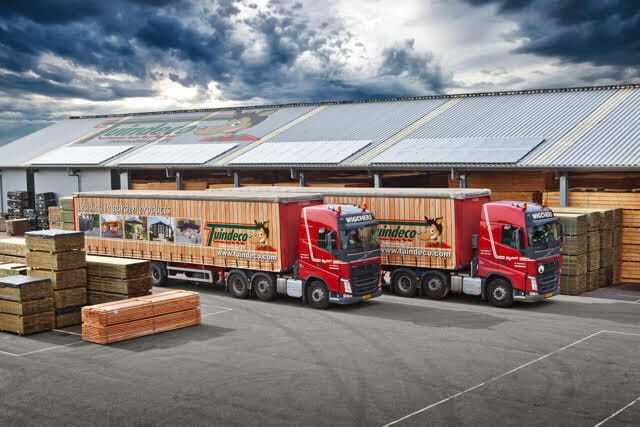 Tuindeco keep stock of all the product ranges in NL and the UK to enable a quick delivery for our customers. TuinDeco are Europes foremost supplier of log cabins, timber, fencing, structures, furniture, garden products etc. Based in Holland with over 1000 products all held in stock in the UK and Holland. Tuindeco trade in virtually every country in Europe, and have hugely high standards and only supply the best at the best prices. Tuindeco are primarily governed by Dutch and German standards, renowned for being considerably higher than in the UK but at least we're catching on to high quality at great prices! We supply a huge range for the garden including Log Cabins, Sheds, Garden furniture, and virtually anything you could need for your garden throughout the UK. For European sales please contact us for possible additional delivery charges. Please enjoy a browse through our brochure. You could also read our Blog to find out more about Tuindeco in the UK. Our Tuin and Tuindeco in pictures page gives you some idea of the scale and size of who Tuin : Tuindeco is in pictures, have a look and see what we can do and what we can offer to our customers. We work a little different to other companies and a lot of our staff work 'flexibly' often from home or on their travels and often out of hours. Our main UK office is in Norfolk and is staffed during the hours of 0900 - 1700 Monday to Friday. Email is always the quickest form of contacting us day, night or weekend. Many of our staff will respond to emails but aren't always available via phone and can often deal with urgent queries quicker than our phone staff whom may already be engaged. We often answer emails out of hours.During normal working hours our target is within 15 minutes, out of hours it's usually within an hour. We have a small site at our main office and maintenance workshops where we display a small selection of our products. We are always here to help - perhaps the Dutch way of doing business has rubbed off on us. 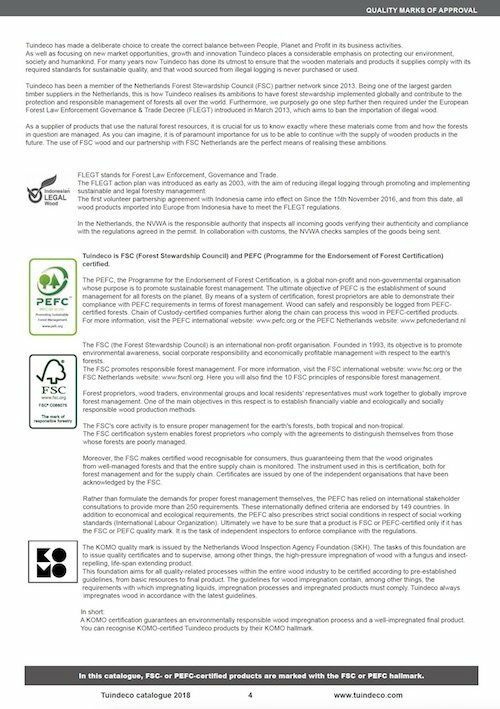 Tuindeco has a number of accreditations for timber. Please see the catalogue for details of these. The Komo hallmark is used by the SKH (Stichting Keuringsbureau Hout: The wood inspection agency foundation). insect-repellent and life-prolonging product. Its objective is the certification of quality control in the timber industry during the process from basic material to fi nal product according to specified guidelines. The guidelines for wood sustainability include the requirements to which impregnation agents, processes and products should comply. Tuindeco always performs its impregnation processes according the latest guidelines. A KOMO certificate warrants an ecological sustainability of the wood resulting in a well impregnated product. You can recognize the KOMO certificated Tuindeco products by the KOMO logo within the catalogue. Timber is a natural product. Drying can cause one-sided distortion. Additionally round wood can develop hair cracks. Both developments will aggravate with the continuation of drying. Moist absorption will counter the one-sided distortion and hair cracks will close again. Properties regarding construction and quality will not be influenced by any of these processes. Please consider the shrinking and expansion of wood in dry and wet periods. When purchasing hardwood products, Tuindeco pay special attention to its legal origin being sustainably managed forests. Our hardwood is supplied with a SICS certificate, provided by Sucofindo International Certification Services, which is an Indonesian government agency that manages and supervises the exportation of legal and sustainable produced hardwood. If you would like any additional information on our products. Our services: Consumers or Retailers then please contact Tuin for more details.